Roofing Parts | Linnert Roofing, Inc. The uppermost portion or peak is known as the ridge. 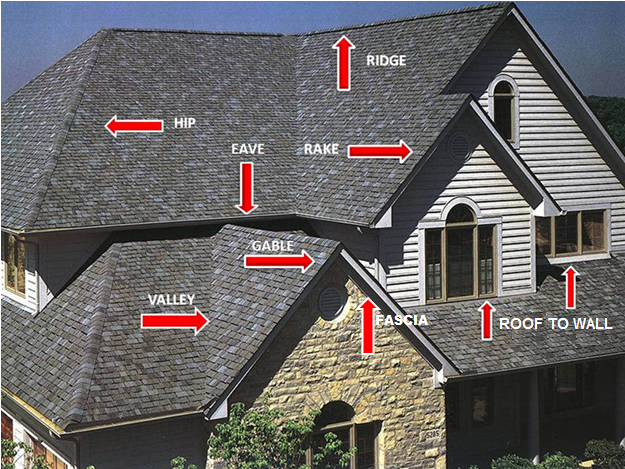 Typically this portion of the roof will have ridge cap shingles installed either over a ridge venting system or without the system if the roof has a different ventilating method. The lowest horizontal plane of the roof is called the eave. The eave is one part of the roof that is very vulnerable. For this reason, extra protection is built in at the eaves. Typically eaves will have drip edge, starter shingles, modified waterproofing underlayment, and gutters installed there. The rake of the roof is the exposed outer portion of a gable roof that extends from the eave to the ridge. Drip edge is also installed along the rake. A gable roof has only two sides, with a ridge at the top and rakes sloping the roof. Unlike gable roofs that have only two sides , both of which are exposed, a hip roof will have 3 or 4 sides and none of the edges of a hip roof are exposed. The edges of a hip roof will have hip and ridge shingles installed just like the ridge. The valley of a roof is the low point between two sloping roofs where the two roof roofs intersect. The following three pictures below are examples of different types of valleys. The fascia is a vertical finishing edge connected to the ends of the rafters, trusses, or the area where the gutter is attached to the roof.